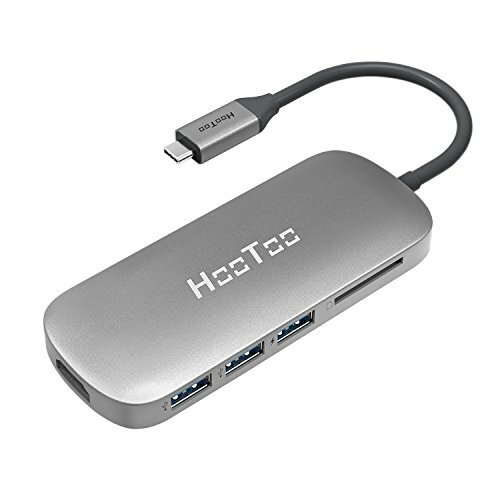 HooToo USB-C Hub Aluminum Type-C Adapter offer a type-C charging port with 100W Power Delivery Specification, HDMI 4K output, 3 x USB 3.0 ports and an SD card slot for simultaneous charging of the latest USB C laptop. Plug-n-play, Hot Swap, Aluminum Alloy Construction. Note: *1. USB ports do not charge iPad or other tablets. *2. Supports multiple flash drives, but can only support one external hard drive at any time due to the power requirements. *3. We recommend using your original manufacturer charger adapters and cables to charge via the Type-C port.